I read in the news that a coffee shop recently fired a barista for allegedly mocking a man who stuttered. The man stuttered his name and the barista had written the customer’s name in a way that appeared to mock the customer’s stuttering. I have several mixed feelings about this incident. I hope that the barista didn’t do this on purpose. I hope it wasn’t intentional. I don’t know for sure. I wasn’t there. I feel empathic for the man who was apparently mocked. I’m sure he has heard jokes and been ridiculed before. I was in speech therapy until 6th grade because I couldn’t pronounce the “R” sound. I had to learn to put the GRRR in Tiger. Mine sounded like gor in Tig-or. It’s one of the reasons I had written the book, “It’s not a Monst-OR – It’s a Monster!” I am very pleased that I did learn how to say this! I do have a relative who is a grown adult (and a physician) who still struggles with the “R” sound. I don’t have an official diagnosis. I may have a Central Auditory Learning Disorder. My parent’s believed I had this as a child. I have a younger relative who had this diagnosis. The diagnosis wasn’t quite out when I was a child. It is difficult to explain. I explain it as dyslexia with hearing. I’d often get similar sounds confused. I’d hear am-in-al and repeat that word back when in fact the other person was saying animal. I wasn’t a very good auditory learner. Verbal instructions were very difficult for me. I’d performed a lot better in classes that had visual learning like an overhead projector (what teachers used back in the 80s before laptops and slideshow presentations). I lacked interpersonal skills. I’m an introvert too. I didn’t have good communication skills to carry on a conversation. A touch of anxiety didn’t help either. I often felt self-conscious of speaking because I knew I often mispronounced words or got words backwards or said things like “I’m going to put the fridge back in the milk now” or “will you grab the car for the keys?” when I mean grab the keys for the car. Fortunately, I’ve made major improvements in all four of those areas listed above thanks to the help of teachers, friends, and speech therapists. Now I facilitate group therapy sessions. I teach webinar training sessions. I’m in charge of teaching orientation for staff at a Psychiatric Residential Treatment Facility. I provide keynote talks on success and achievement. I don’t think it is funny to mock, ridicule, or joke about any disorder. No human is perfect. Every one of us has problems. I forgive the barista. She isn’t perfect either. My three best suggestion include: a.) be nice; b.) be easy-going; and c.) keep improving. Be easy-going if someone points out a flaw. As a child, I’d feel very embarrassed if someone (anyone) pointed out when I mispronounced a word. Many times I didn’t even realize I said it backwards or wrong. Often times, It isn’t the end of the world. I share sincere appreciation if someone lets me know. It doesn’t help if someone doesn’t tell me because they don’t want to “hurt feelings.” Being easy-going helps. Sometimes friends just like to play and have fun with each other. My friends laugh when I say things… and I’m okay with that because they’re my friends and they’re coming it at from a playful approach and not one to intentionally hurt me. I use the same easy-going approach when someone is trying to be hurtful. Keep improving. Do the work. Strive to improve and get help mastering any areas. All people have the potential to improve through practice and training. Very Inspiring to read your shared story. Danny you are a Great Man! You’re a Major Catalyst for Professionalism for the TR Profession! Great accomplishment from transitioning from pupil to teacher. Keep that head up high! Great success story! Having taught special education for severely disabled middle school students for many years, speech seems to be the uppermost difficulty in special education. However, many people can learn to communicate regardless of speech Some ASD individuals will never speak but can learn to receptive and expressive communication very well. I believe many have too high expectations. My mother couldn’t pronounce her ‘r’ sounds her entire life. It did not stand in the way of her having a happy and fulfilling life! People who “make fun” of others who do not have the same abilities as they do are full of fear and were obviously not raised well. I try to give them the same tolerance that I’d like them to have for others but this is difficult to do. If I see someone hurt another emotionally it breaks my heart 💜. I’ll pray for them. 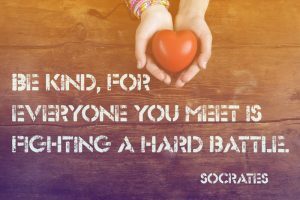 When in school, it’s a teachable moment but as adults in the public, those of us who know better can maybe help in some way by being more loving.